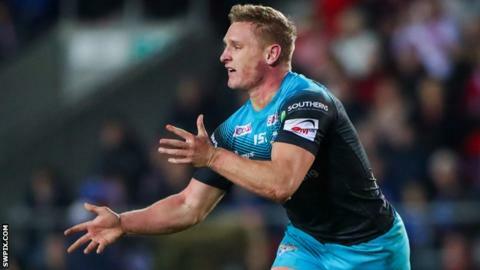 Leeds beat Huddersfield to win just a third Super League game this season and climb off the bottom of the table. Brad Dwyer was instrumental for the Rhinos, creating three and scoring one of their five first-half tries that helped secure a 30-0 lead at the break. That effectively ended the contest but Huddersfield did cross three times after half-time to narrow the gap. Leeds forward Nathaniel Peteru was sin-binned late on, but his side then made sure with Ash Handley's breakaway try. Peteru's yellow card for a dangerous tackle was the second time a Rhinos player was sent from the field during the game, with winger Tom Briscoe spending 10 minutes of the first-half on the touchline for obstruction. That incident was the only blip in a near-perfect opening period for Leeds as Tui Lolohea, James Donaldson, Brad Dwyer, Richie Myler and Briscoe all touched down, with all but one converted by Liam Sutcliffe. It was the sort of dominance they have regularly been on the receiving end of during what has been a difficult first season under head coach David Furner. There were still signs of the Rhinos' defensive frailties as their opponents fought back through Akuila Uate, Adam O'Brien and Darnell McIntosh tries. Furner will doubtless have been breathing a sigh of relief when Handley seized on a spilled ball to run the length of the field and ensure his side would move off the bottom. Although still only 11th, they are now just two points behind eighth-placed Huddersfield in the table. Leeds: Briscoe, Watkins, Hurrell, Handley, Lolohea, Myler, Dwyer, Sutcliffe, Ferres, Peteru, Donaldson, Newman, Albert. Interchanges: Parcell, Singleton, Oledzki, Jones-Buchanan. Huddersfield: McIntosh, McGillvary, Turner, Uate, Frawley, Leeming, Matagi, Murphy, Ta'ai, Jake Wardle, Russell, Hewitt, Joe Wardle. Interchanges: Clough, Lawrence, O'Brien, Ikahihifo.